Nick Verres and Oscar Garcia-Lopez--Episode 11 "The Benefit of Fashion" Challenge "Project Runway: Under The Gunn"
Burlesque Purple: For the "Challenge Announcement", I wore one of my favorite purple suits--it's a purple colored sateen Topman suit with black satin shawl collar lapels. 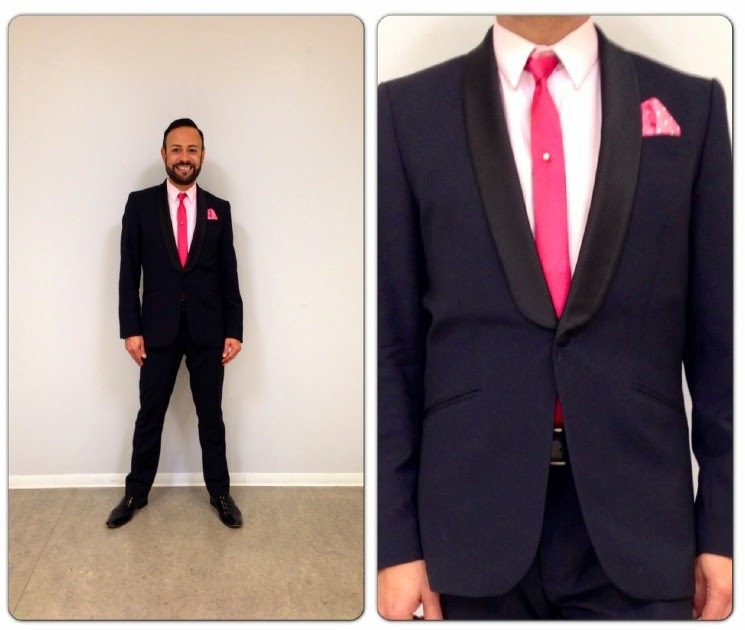 I wore it with my skinny black tie from Topman and my teal velvet "slippers" shoes from H & M.
The following day--for Runway--I wore my "midnight blue" shawl-collared tuxedo suit from H & M, my skinny pink tie from Calvin Klein and polka dotted Brooks Brothers pocket scarf. I also wore a pearl tie pin that was a gift from my Dad. Midnight Blue...and PINK: Since by now, I knew that it was a "Benefit Cosmetics" Challenge, I realized the brand was "big" on the pink color...therefore I purposely wore my bright pink tie and pocket hankie. Those were my "wink-wink's" to Benefit in regards to how much I LOVED their cosmetics! Nick-Mondo--During some "Project Runway: Under The Gunn" filming down-time, I had the chance to pose with my fellow mentor, Mondo Guerra in the fabulous Benefit Cosmetics "Pretty Room". **Don't miss this week's Episode of "Project Runway: Under The Gunn"! It's all about Marvel Comics Superheros...And yes, this is the Penultimate Episode before NEXT WEEK'S FINALE!!!! 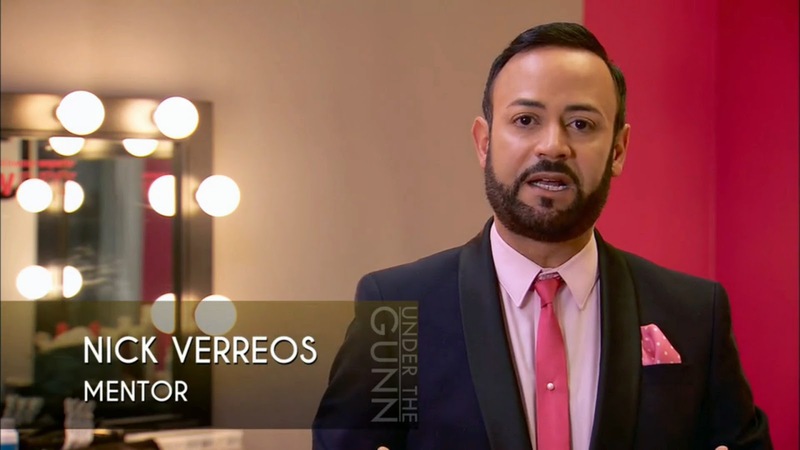 0 Response to "PROJECT RUNWAY.....Nick's Looks Project Runway: Under the Gunn Episode 11 "